There's plenty of evidence that water once flowed freely on the surface of Mars (see water). Today, however, we know for sure that it exists only in the thin Martian atmosphere as wisps of vapour, which occasionally condenses out as ice at the winter poles. Recent results from Mars Global Surveyor (MGS) suggest that liquid water may still occasionally bubble up from underground but if so, it doesn't remain on the surface for long. So where did the quantities of water from early times go? Much has probably been lost to space with the Martian atmosphere, which has thinned enormously over the past 3.8 billion years. 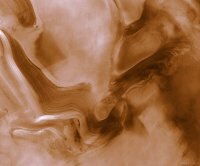 Several of the experiments on board Mars Express will be looking for mechanisms to explain this atmospheric loss. Many planetologists, however, believe that a lot of water must still be on Mars, locked into frozen or liquid underground reservoirs and the recent MGS results support this view. MARSIS (Mars Advanced Radar for Subsurface and Ionospheric Sounding) will set out to map underground water and ice. Evidence from Mars Global Surveyor (MGS) of relatively recent water flow down a valley side from underground aquifers. The instrument is a type of ground penetrating radar. On Earth, such radar is typically operated from the ground or from aircraft to prospect for water or man-made objects a few tens of metres below ground. On Mars, it will search for water up to 5 km below ground from its vantage-point on board Mars Express. "Spaceborne ground penetrating radar sounding has been attempted only once before, in a successful experiment during one of the Apollo lunar missions. MARSIS will be the first such radar to look for underground water. It is unique," says Giovanni Picardi, MARSIS Principal Investigator from the University of Rome "La Sapienza", Italy. MARSIS will send low frequency radio waves (1.3-5.5 MHz) towards the planet from a 40 m long antenna which will be unfurled after Mars Express goes into orbit. The entire instrument including antenna and data processing unit weighs about 12 kg. "We need such a long antenna so that we can work with long wavelengths, which are able to penetrate Mars for a few kilometres," says Roberto Seu, who is the Deputy Principal Investigator. The radio waves will be reflected from any surface they encounter. For most, this will be the surface of Mars. But because of the low frequency, a significant fraction will travel through the crust to encounter further interfaces between layers of different material. "If there is a layer containing liquid water, it should generate a radar echo," explains Seu. "The presence of weaker signals after the first strong surface return will enable us to detect subsurface interfaces, while the time delay between the two signals will allow us to measure the depth of the interfaces," adds Picardi. Mars Express in orbit around Mars with MARSIS antenna unfurled. By sending two different frequencies at the same time and analysing the echoes generated, MARSIS will be able to extract information on the electrical properties of the reflecting surface and hence its composition. "An underground zone of liquid water will have very different electrical properties from the surrounding rocks and it will reflect very strongly," says Jeff Plaut, the Co-PI from the Jet Propulsion Laboratory in Pasadena, California, US. "We should be able to see the top of a liquid zone somewhere in the upper 2-3 km fairly easily. If other conditions are favourable, we may be able to go down to 5 km or more." The radio waves will be reflected at any interface, not just that between rock and water, so MARSIS should reveal much about the composition of the top 5 km of crust in general. It should, for example, pick out layers of rock interspersed with ice, which are more likely to exist close to the Martian surface than liquid water. "We should be able to measure the thickness of sand deposits in sand dune areas, or determine whether there are layers of sediment sitting on top of other material in areas hypothesised to be the sites of ancient lakes or oceans," says Plaut. "We may even see the boundaries between different lava flows." The best ground penetrating studies are made during night when the Martian ionosphere is least active and when the spacecraft is less than 800 km from the Martian surface, a condition that occurs for 26 minutes during each 6.75 hour orbit. During the lifetime of the mission, the instrument will be able to conduct ground penetrating studies over the entire planet. During the day, sunlight ionises the upper atmosphere (charges it up electrically) and long wavelength radio waves bounce off it. Those that are reflected from the ionosphere can reveal much about its structure. MARSIS will measure the electron density in the ionosphere and hence quantify the effect of charged particles streaming out from the Sun (the solar wind) on the upper atmosphere. Such measurements will complement those of other instruments whose prime task is to find out whether the unremitting depredations of the solar wind over billions of years have stripped Mars of much of its atmosphere (see ASPERA). For the first 100 days of the mission, however, the orbit will be lower than 800 km during the daytime only. MARSIS will take this opportunity to sound the subsurface at the higher end of its frequency range, study the ionosphere and perform instrument calibrations. This involves measuring the return echoes sent back from the surface only in order to get reliable readings during sounding operations. Once the calibration is complete, dayside subsurface and ionospheric soundings will continue for the remainder of the 100 days. 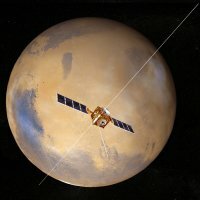 For the following 200 days, the lowest part of Mars Express's orbit will occur during night in the southern hemisphere. "This should allow MARSIS to make some very interesting observations of the south polar cap and the surrounding layered terrain," says Plaut. MGS image of Martian layered terrain. MARSIS will work well wherever the material in the Martian crust is organised into layers. Recent images taken by NASA's Mars Global Surveyor spacecraft show layering in many regions of the planet. 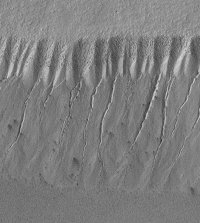 But the poles have long been famous as the regions of layered terrain (see poles) and many planetologists believe that the layers may hold clues to the history of climate change on Mars. NASA's ill-fated Mars Polar Lander would have explored this region if it had landed successfully. MARSIS, on board Mars Express, shows promise of making up for at least some of the loss. Over subsequent days, optimal conditions for ground penetrating studies will occur over different regions of the Martian surface, allowing MARSIS to build up a three dimensional picture of the upper layers of the entire Martian crust over the mission's lifetime. "We know water is present as ice at the poles and we think ice is present in the crust. It should occur near the surface at the poles and somewhat deeper at the equator. In fact, it may be present almost everywhere," says Seu. MARSIS will be the first instrument on any spacecraft to really test the validity of some of our ideas about water on Mars. For further information see related links.